We specialize in the breeding and raising of German Shorthaired Pointer's. The German Shorthaired Pointer is a versatile, all-purpose gundog. We breed for nose first then build our dogs from there. Let us build your next versatile hunting dog to enhance your hunting experience and to experience the life changing effect our shorthairs can have on your whole family. We train our own hunting dogs and gun dogs. These AKC sporting dogs are trained on hunting quail, phesant and water foul in Southern Illinois. All dogs get the love, attention and training a good bird dog requires. M & M's Southfield Kennel has some of the top male shorthairs in the breed standing at stud. We also have litters of pups out of our exceptional males and females. German Shorhairs are loyal, obedient, respectful and active. 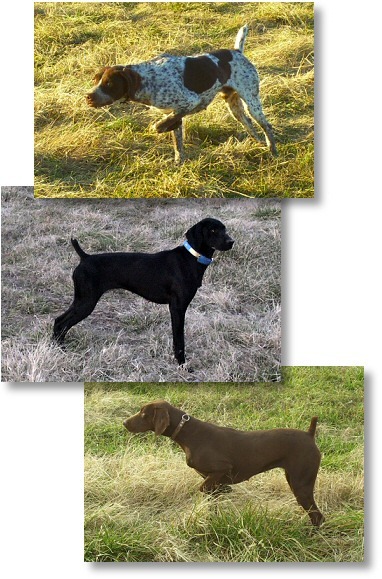 Each German Shorthair puppy will make an outstanding family member as well as a great hunting and trial dog.